The New Zealand East Cape chemotype of Manuka (leptospermum scoparium) extracts have been used for healing purposes by the Maori people since they first migrated from the Pacific Islands around 900 years ago. The Maori people used the leaves, bark and seed capsules of the Manuka bush for a wide range of ailments, including urinary problems and as a febrifuge (to reduce fever). The leaves were boiled and the hot vapour inhaled for head colds. Leaves and bark were boiled together and the warm liquid rubbed on stiff backs and rheumatic joints. These Manuka extracts were also used as a diuretic, a sedative, a painkiller, for inflammation of the breasts, and for healing fractures. Boiled bark was used to relieve constipation, as a gargle and for bathing sore eyes. The emollient gum was given to suckling babies, and was applied to scalds and burns. Fresh sap was taken as a blood purifier, seed capsules were boiled and the fluid used externally for bruises and inflammation, and internally for diarrhea and dysentery. Raw seed capsules were chewed for colic, and when powdered, used in a poultice to dry and heal open wounds or running sores. “New Zealand Medicinal Plants” by S C Brooker, R C cambie, R C Cooper. Published by Heineman Publishers, Auckland, NZ. Third Edition, 1987. “Medicine of the Maori written by Christina McDonald. Published by William Collins (NZ) Ltd, Auckland, 1974. Reprinted.1975. The English explorer Captain James Cook first visited New Zealand in 1769 and described the Manuka plant as a ‘tea plant’ hence the colloquial name tea tree. Captain Cook used the leaves of the Manuka bush as an alternative to traditional black tea to ward off the effects of scurvy amongst his crew. During the following two centuries since Cook wrote about Manuka in his journal, little more information of scientific nature was published. It is amazing to discover that all these therapeutic uses of the Manuka tea tree plant were identified by the Maori people centuries ago, and only now, in the past two or three decades, has modern science confirmed that these uses were legitimate and the active compounds identified in scientific analysis. Today, rather than crushing and boiling the leaves, sap and seed capsules of the plant, modern steam extraction produces essential oil in pure form which has been the basis of the scientific studies that have followed. Since the 1980’s there has been considerable research around the world to identify natural plants and plant extracts that can provide alternatives to a wide range of synthetic drugs that are experiencing increasing resistance by bacteria, fungi and viruses that cause skin infections and other ailments. Plant species from the Amazon jungle to the highlands of South East Asia, Australia and New Zealand amongst others have been put through exacting extraction and testing procedures to identify if these plant species could provide solutions for modern medical science. Now, it has been described in scientific papers that one chemotype of Manuka plant, grown almost exclusively in the East Cape region of New Zealand’s North Island, containing high levels of Triketone compounds has significant antibacterial, antifungal and antiviral properties making this oil a genuine alternative and in many cases superior to conventional synthetic forms of topical medication. The Cawthron Institute in Nelson New Zealand and the University of Otago, New Zealand Department of Microbiology testing showed East Cape Manuka oil to be active against a wide range of micro-organisms that cause irritation and infection of the skin and body. The Cawthron Institute concluded that East Cape Manuka Oil was 20 – 30 times more active than Australian Tea tree oil against gram positive bacteriaand more than 5-10 times more effective against tested species of skin fungi, while the University of Otago, Department of Microbiology confirmed that East Cape Manuka oil is effective in combating bacteria and fungi that cause Tinea (Athletes foot), foot and body odour. 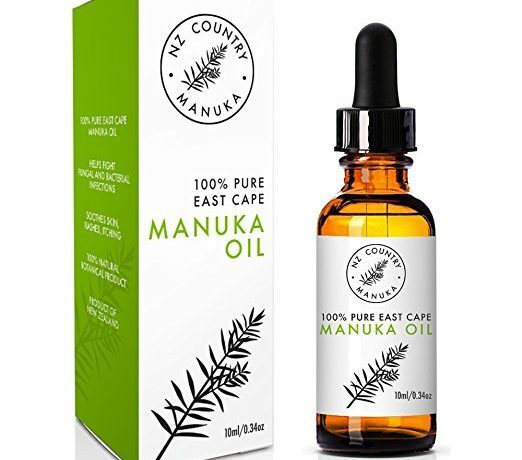 These studies have shown that there is a wide range of application for the essential oil of Manuka and as an active ingredient in a range of topical applications for common bacterial, fungal, yeast and viral infections. Scientific evidence now supports the view that the New Zealand Manuka plant and its derivative products incorporating UMF® honey and essential oil have become recognized as one of the great natural therapeutic plant discoveries of the modern world.